This is the first ever awake brain surgery for brain tumor in Bangladesh. 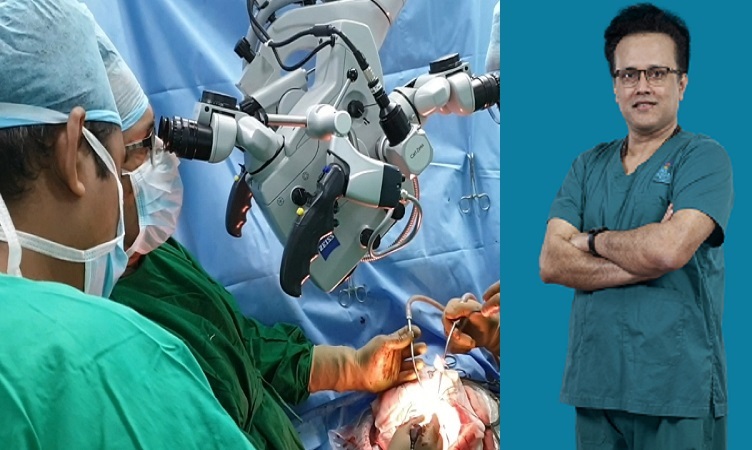 Dr. Amitabha Chanda is one of the pioneers of Awake Brain Surgery for tumors in India and he has performed the one of the largest numbers of awake brain surgeries for brain tumor in India. An awake craniotomy is a unique operation performed in the same manner as a conventional craniotomy but with the patient awake during the procedure. This is a preferred technique for operations to remove lesions close to, or involving, eloquent (functionally important) regions of the brain, like area responsible for speech, for movement of limbs. This allowed Dr. Amitabha Chanda to test regions of the brain before they are incised or removed and allowed him to test patient’s function continuously throughout the operation. The overall aim is to minimize the risks of paralysis or loss of speech following such operations. A 58-year-old gentleman from Faridpur was having recurrent seizures and he developed weakness of the right hand as well. The tumor was on the left side of the brain and was on the motor area (the area of brain which controls the movement of the opposite side of the body). Moreover, left side of the brain also controls speech. Since the tumor was on the motor area, a unique method was adopted to avoid paralysis and loss of speech. During surgery the Dr. Amitabha Chanda needed to communicate with the patient and patient should be able to follow doctor’s commands. So whenever the motor area or speech area was reached, Dr. Chanda looked for any problem in movement of the limbs or speech disturbance. If anything of this happened, he would have immediately stopped there, so that speech or limb movement was not hampered. However, if this was done under general anesthesia the neurosurgeon will not know if there was any damage to motor area or speech area of brain. That is why Awake Brain Surgery is important for these type of patients (who have tumor in motor area or speech area of brain) to protect speech and limb movements. The patient was counseled well before operation. He was explained about the procedure completely. The tumor was removed completely for the gentleman and he went home in 4 days. The power in the right upper limb improved markedly after operation.